Make happy customers your competitive advantage. Customer experience is the practice and discipline of viewing your business from the perspective of your prospects and customers. It&apos;s a combination of research and attention to detail that allows your business the ability to anticipate their needs in advance of them having to request a new product, service, or feature. This applies to more than just when you’re getting your customer to buy your services. Customer experience means making your customer happy during each interaction with your business—from becoming aware of your services to using your services to retaining your services. Customer experience drives revenue. After all, it’s cheaper to engage an existing customer to repurchase then it is to find a new customer. Who does customer experience well? Trader Joe’s: the popular grocery chain delivers a whopping 69 positive customer experiences for every negative experience. In 2018, Trader Joe&apos;s was the named the top retailer providing a high-quality customer experience, according to the Forrester Research. The study evaluates 287 brands in the United States across 19 industries to identify how well the brand’s customer experience strengthens the loyalty of its customers. How does Trader Joe’s deliver such a great customer experience? Put simply, they listen to their customers. Trader Joe’s puts customers first and reaps the rewards with $13.3 billion in annual revenue. Trader Joe’s doesn’t react to customer feedback, they are proactive about it. Store managers (called "Captains") at Trader Joe’s spend most of their day on the retail floor and directly interact with customers, immediately altering the store and its products to local needs. Crew members respond to customers in ways that encourage trust and emotional connection. When asked about a product, they instantly bring you the product, open it, and give you a taste test to make sure the it is to your liking. Trader Joe’s also refunds your money for any product that you are not satisfied with. They even design their stores around their customers. Every Trader Joe’s is around 15,000 square feet--roughly ⅓ of your typical grocery store, and that&apos;s on purpose. They design it this way so that you have both an expedient and pleasant grocery shopping experience. Each store is also decked out with murals of the city the store is located in, featuring landmarks of the town. This small detail helps customers build an emotional connection to the store. Bottom line: Trader Joe’s leverages the value of customer experience. They figured out what they do really well (selling high-quality food at a low price) and change with their customers’ tastes at a place designed to make them feel at home. Who did customer experience not-so-well? Taxis: The Yellow Cab Co-op filed for bankruptcy 2016. In 2018, it was sold to a rival company for far below its market value. Not only did they fail to adapt as the industry shifted to smartphones, they flat out provided a bad customer experience. When there was a bad experience, it was extremely difficult to get in touch with the company. Especially in the cases of major collisions and injuries, which often resulted in multi-million dollar lawsuits. This set the stage for the customer-driven and convenient competitors, Uber and Lyft. What makes Lyft a better customer experience than the Yellow Cab Co-Op? Convenience: Smartphone technology helps riders find a cab and vice versa. Lyft has far shorter wait times because there’s a much greater chance that a Lyft is nearer to you than a taxi at any given moment. Accountability: Lyft&apos;s review system lets riders and drivers rate each other after each ride, so there are rewards for a great experience and consequences for a bad one. If you have a terrible experience with a Yellow Cab, filing a complaint or trying to get a refund can be quite a hassle. With Lyft, all you have to do is 1) tap the Menu icon 2) tap Ride History 3) tap Get Help. Rewards: Lyft riders earn points (Lyft Rewards) for every dollar they spend. Lyft points will get you upgrades and savings on future rides. Customer-experience culture: Lyft’s customer-centric culture starts from the top down; executives regularly drive passengers so they can understand the experience from both a driver’s and passenger’s point of view. This shows other employees how important it is to stay close to the customers and understand their needs. How can you measure customer experience? Financial metrics are only part of measuring customer happiness. The best way the measure customer experience success is to tap into its source: customers themselves. Online reviews: The average rating from online review sites like Google and Facebook are a good indicator of how your customers feel about your business. To go the extra mile, read and respond to those reviews. Net Promoter Score (NPS): This metric is based on the question “How likely are you to recommend us?” with a ranking of 0 to 10. You can send emails to your customers asking for feedback yourself, and there are also many online survey tools to make is easy for you. Customers who answer 0-6 are considered Detractors and are likely to spread negative word-of-mouth. Customers who left a 9-10 scores are Promoters, and are valuable brand advocates. Those who rate 7-8 are Passives, and could easily become Detractors or Promoters depending on their next experience. You calculate your NPS by subtracting the number of Detractors from the number of Promoters. Social media engagement: Today, 80% of consumers use social media to engage with brands. All those posts, comments, likes, and shares on sites like Facebook, Twitter, and LinkedIn can tell you how engaged customers are with your business, but also helps businesses like yours engage with your customers. Customer churn rate: This is the percentage of customers who don’t return or cancel their subscription. A good customer experience can help lower churn rate. How can you provide an amazing customer experience that grows your business? Let’s take the first step in providing a 5-star customer experience by Googling your business. Is your business listed on multiple review sites like Google reviews, Avvo, Zocdoc, Facebook, TripAdvisor, etc.? Have you read all of these reviews? Have you responded to all of these reviews? Have you gleaned insights from what your customers are writing about your business—both the good and the bad—in order to improve your business? If you want to provide an excellent customer experience, online reviews should be a huge part of that strategy. How? Make your customer feel special. Show your customer that they are more than a [First Name] with personable, in-the-moment engagement across all channels. Promptly reply to all reviews in a kind, authentic way—whether you are thanking your customer for the wonderful review or addressing the grievance of a more critical review. Use humor, share photos—anything that helps your customer get to know you. Resolve all customers’ issues by going above and beyond. A bad review does not have the be the end of your relationship. Win your customer back by proving your devotion with amazing customer service. Winning back a customer who had a negative experience is known as the service recovery paradox. Basically, if that issue gets resolved rapidly and to their satisfaction, that customer is actually more loyal than customers who never had an issue at all. Create. Offering new services that are important to your customers can disrupt your competition while giving your customers what they really want. Constantly monitoring your customer experience is worth the time. Ask for feedback. If reviews aren’t giving you enough insights into how to improve your customer experience, you can always just ask the customers for feedback yourself within one to two days of seeing them. Listen to what your customers are saying about your business across all channels. Monitoring and managing your online reviews will definitely make a dent in your customer experience initiatives. Spotting trends over a period of time is the next step to knowing what changes to make in order to make your customers happy. Looking at month-to-month trends is a great place to start. Example 1: You receive a 1-star Google review. It states, “Delicious meal. Lovely waitress. But the chicken was undercooked.” As a result, you respond to the customer review by not only apologizing, but also giving them a free appetizer and a bottle of wine on their next visit. This is review management. Example 2: A month goes by, and you see a trend developing of complaints on Facebook about the food only on days a specific chef is working. With this knowledge, you can go to that chef and make him aware of the problem. This is social listening. Use what you learn from these reviews and feedback. Show your customers that you are by making changes to improve negative experiences, and replicate positive experiences. This doesn’t mean you have to completely overhaul your business model. Sometimes it’s the little things that count. Example 1: You’re a dentist. You read reviews that consistently mention how much your patients love that they can watch Netflix while getting a root canal, but they’d love to be able to watch Hulu too. Now all you have to do is download Hulu and your patients are delighted. Not just because they can now catch up on “The Mindy Project” in the dental chair, but that you listened to them. You have a patient for life now. How easy was that? Example 2: You own an auto repair business. You read reviews that consistently point out how bad the coffee in the waiting area is. Wouldn’t it be great if you 1) invested in some Starbucks and a new coffee maker 2) responded to those reviews with “I’m sorry you had such a terrible experience with our coffee. We now serve a variety of Starbucks roasts and blends, and we’d be happy to serve you some in a free ‘I’m Sorry’ coffee cup that you can take home with you. We’ll also check your tires free of charge.” Delighted customers? I think so. And potential customers researching auto repairs in your area will also be delighted to see how well you handled a customer complaint. I understand these are a lot of steps which can take a lot of time. Especially without a marketing team at your disposal. Time that you don’t have because you’re busy fixing smiles or an alternator. No need to worry, we’re here to help. 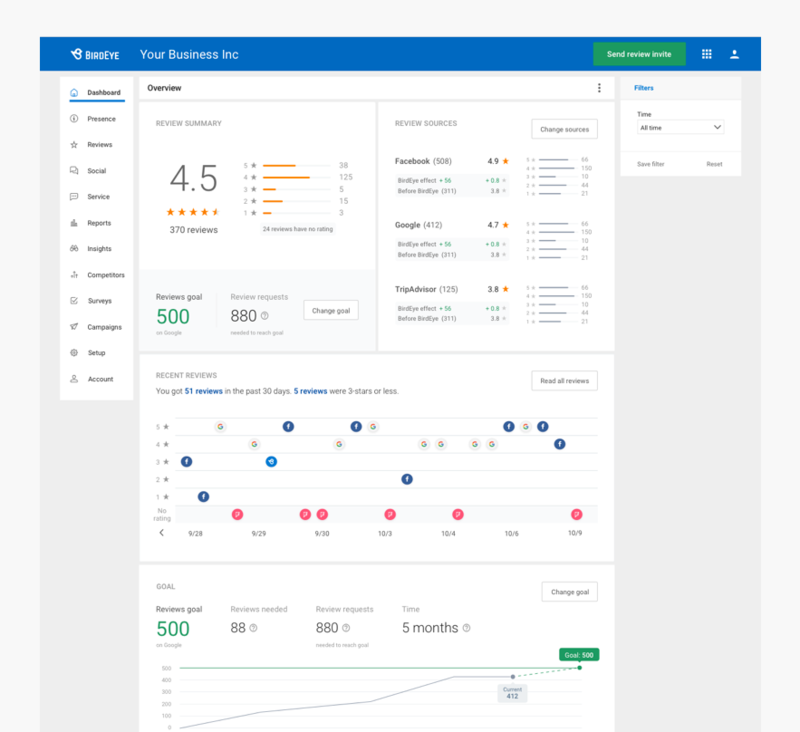 A review management tool like BirdEye can help you because we put all your reviews from 150+ sites into one place. You can monitor and manage all these reviews, from Avvo to Zocdoc, on one comprehensive dashboard. If a bad review does get posted, we’ve got your back. 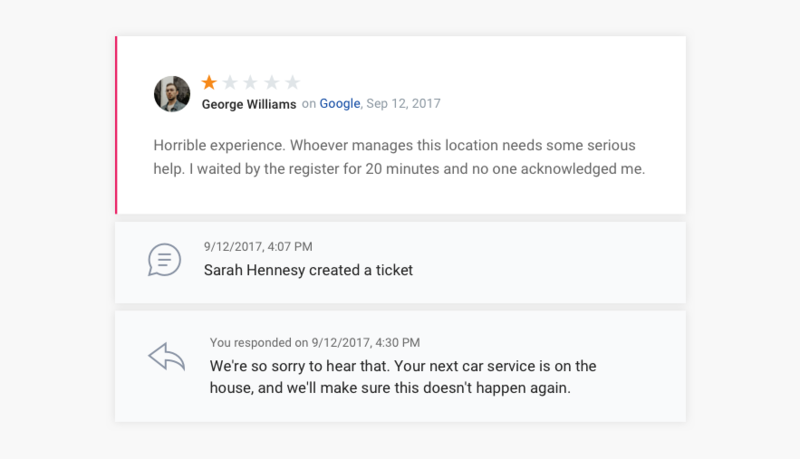 BirdEye’s review monitoring tool will automatically convert that bad review into a service ticket, ensuring that you don’t miss out on an opportunity to turn an unhappy customer’s issue into a victory with a swift response to the customer grievance. No time to ask for feedback? 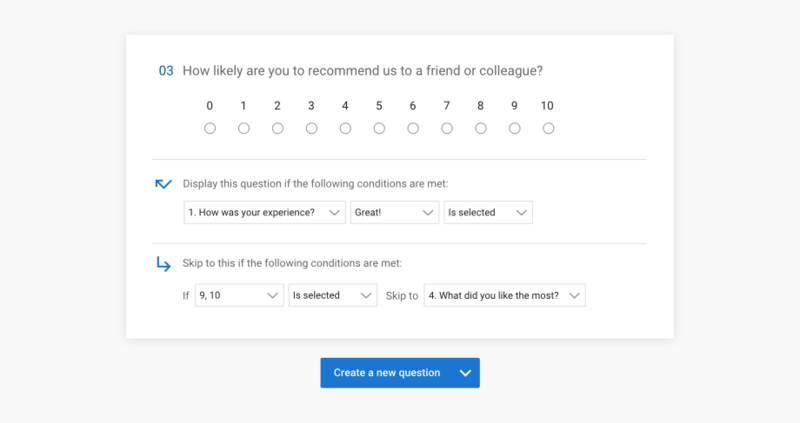 BirdEye’s surveys are an awesome way to effortlessly connect with your customers. They also help you engage at the right time, on the right channel. Want a better understanding of what products and services your customers’ and prospects value? 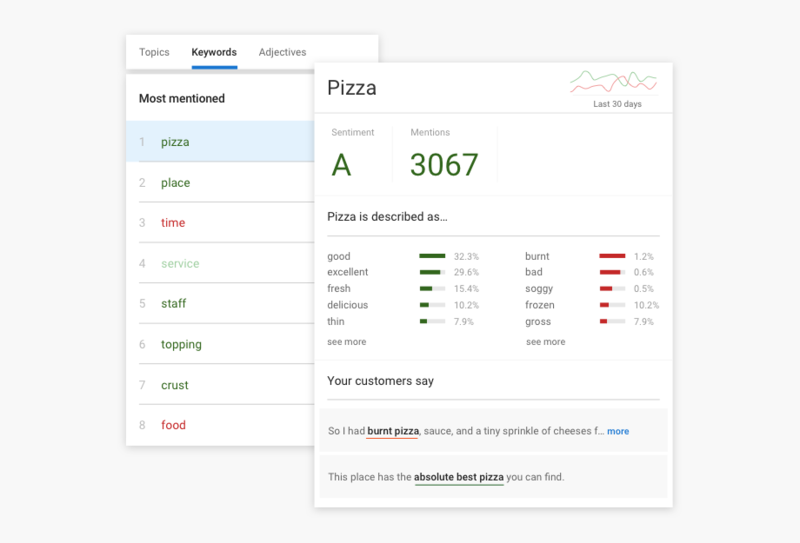 A business insights tool like BirdEye can dig deep into customer feedback to reveal positive and negative themes emerging within your market. Our social listening tool also lets you track your customers’ social conversations across 300M+ websites, blogs, forums, and social media networks like Facebook, Twitter, and YouTube. With all of these actionable insights at your disposal, you are set up for success. Remember how difficult it was for Yellow Cab’s customers to get in touch with their support and/or get a refund after a bad experience? Remember how easy it was for Lyft’s customers? 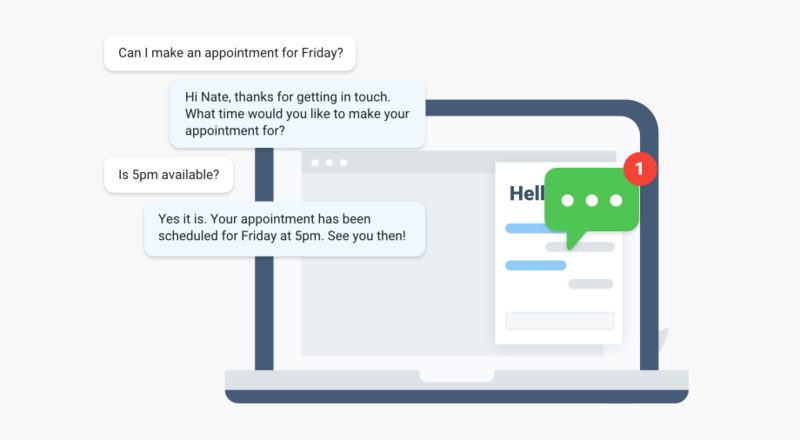 BirdEye’s Webchat helps you respond to you customers and prospects faster by converting every incoming chat from your business’s website into a text message. This way you can immediately reply on-the-go, right from your phone. Happy customers drive revenue. And we’re here to make that easier on you. Want to learn more about the customer-driven marketing? Then download this eBook, “Getting Your Customers to Do Your Marketing for You” was written just for you.